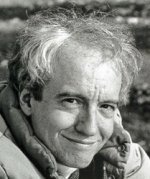 James Morrow has been called "The most provocative satiric voice in science fiction" by the Washington Post. It may be true. He won a World Fantasy Award for his novels, Towing Jehovah and Only Begotten Daughter, and has been nominated for his collection, Bible Stories for Adults. 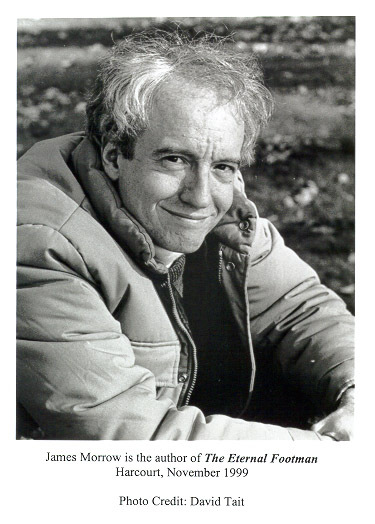 Born in 1947, James Morrow is a highly significant practitioner of literary SF and Fantasy. His novels and stories are erudite and stylish satires, particularly upon religion; his wit is sometimes hard-edged, sometimes whimsical, but invariably telling. His eight novels are The Wine of Violence (1981), The Continent of Lies (1984), This Is The Way The World Ends (1986), City of Truth (1990, in actuality a long novella, and winner of the Nebula Award), Only Begotten Daughter (1990), and the volumes of The Godhead Trilogy, Towing Jehovah (1994), Blameless in Abaddon (1996), and The Eternal Footman (1999). He has published two collections: Swatting At The Cosmos (1990), a slim small-press retrospective, and the rather more substantial Bible Stories For Adults (1996). His current project is The Last Witchfinder, an ambitious "pseudo-historical novel" with fantastic elements. You are widely regarded as the foremost satirist associated with the SF and Fantasy field. How do you personally define satire? What is the fundamental purpose of satire as a broad cultural phenomenon? Hamlet said that skilled actors "hold, as t'were, the mirror up to Nature." I think the satirist works with mirrors, too, but they're of the fun-house variety, the sorts of mirrors that turn you into a beanpole, a billowing blob of flesh -- some wild distortion of yourself. And the satirist's goal is not to reflect Nature but rather to reflect the most troublesome aspects of human society. By deliberately distorting some particular human foible, the satirist aims to help the reader perceive that foible in a new way -- perhaps the reader will even see it clearly for the first time. At base, the satirist is a moralist -- often an angry moralist. He doesn't know how to fix the world, but he knows that it's in a lot of trouble, and he's anxious to share his diagnosis. Just as the first step in treating a disease is coming up with a correct diagnosis, the satirist believes that the first step in ameliorating a social ill is naming it accurately. Animal Farm, Catch-22, and Cat's Cradle are great works of satire because they gave us a new vocabulary for talking about what has gone wrong. I would distinguish true satire from such related idioms as parody and burlesque. Douglas Adams's Hitch-Hiker's Guide to the Galaxy and Terry Pratchett's various buffooneries offer their readers abundant joy, but I wouldn't call them satire. Adams is primarily out to delight us with his marvelous send-ups of genre tropes. But the satirist isn't terribly interested in delight, certainly not in delight for its own sake. Satire is a deadly serious business. It's funny only by default. We satirists use humor primarily to get the reader's attention. Humor is the wooden horse that lets you sneak your agenda inside the walls of Troy. A writer with whom you're often compared is Kurt Vonnegut. Do you feel this is valid? Have Vonnegut, or any other writers you could name, especially influenced your work? I consumed heavy doses of Kurt Vonnegut while composing my first two novels, and I'm sure that some of his attitudes and sentence rhythms crept into my prose. He is clearly one of my psychic mentors, but no more so than Jonathan Swift, Henrik Ibsen, George Bernard Shaw, George Orwell, Mark Twain, Joseph Heller, Albert Camus, and -- my true idol -- Voltaire. At a certain point, the Vonnegutian and the Morrovian sensibilities part company. In the long run I'm a humanist -- I'm impressed to pieces by much of what our species has accomplished over the centuries. Vonnegut is basically a nihilist, I'd say. The further you venture into his oeuvre, the clearer it becomes that for Vonnegut the human race is a grotesque mistake -- an unfunny joke that nobody gets. Let me hasten to add that, for all his facetiousness, Vonnegut's nihilism is not facile; it's agonized and well earned. But it's not my personal view. Your early novels gave you a profile as an SF writer; in the 1990s, you shifted more in the direction of Fantasy, although certainly not Fantasy of the Tolkienian variety. Did you become associated with these speculative genres by intention, or were they more the publishing niches into which your books happened most conveniently to fit? When I first entered the field, it was just beginning to lose the provisional respectability it had acquired in the seventies via the New Wave and the rise of SF Studies in academia. At the time, I couldn't perceive this incipient loss of prestige. If I had, I might have fought to avoid the stigma of being labeled a "science fiction" or a "fantasy" author -- the same fight that Vonnegut had waged and won in the sixties, and that Jonathan Lethem has waged and won in recent years. But I've come to praise science fiction, not to bury it, because there's another side to the whole issue of stigmatization. Science fiction has given me a home, a community, a readership, several awards, and a rough approximation of a living wage. I would contrast this with the chronic anonymity -- the non-career -- that inevitably greets the man or woman who writes several mainstream novels that go nowhere. The American publisher of This Is The Way The World Ends packaged it wholly as a mainstream novel. As such, it nabbed some blurbs from established literary figures, got some serious review attention... and died a dog's death in the bookstores. No mainstream paperback publisher wanted to reprint it. But then the SF world came to the book's rescue. World Ends got a Nebula nomination, the SF Book Club picked it up, and Susan Allison decided to do it in her Ace Books mass-market line. Today, World Ends is still in print as a trade paperback from Harcourt, and that wouldn't have happened if the SF infrastructure hadn't put it on the map. What's frustrating about "the speculative genres" is that they are essentially marketing categories -- they tell librarians and bookstore employees where to shelve their inventory -- not formats for artistic expression, but the public doesn't see it that way. Say "science fiction" to a mob of readers who regard themselves as connoisseurs of serious contemporary literature, and an attitude kicks in that I can only call bigotry. I wish the world's snobs understood that quality is where you find it -- but if they knew that, not only would they have to work harder, they would lose their status as snobs. You have a particularly attractive literary style, mellifluous yet wittily epigrammatic. How did you cultivate this admirable textual polish? Many years ago I made a succession of 16mm experimental films and educational shorts. I was the sort of filmmaker who hated the shooting process and loved the editing process. In the cutting room, you can make all sorts of marvelous effects happen that never seemed possible on the set. Every filmmaker knows that the most powerful moments in a movie often result from the excision of just two or three frames. The audience never realizes that you once had those two or three vanished frames at your disposal. They understand only that they're being affected by what's up on the screen. This aesthetic carried over into my fiction. I hate composing the first draft of a scene, and I love reworking that same draft again and again -- the writer's equivalent of trimming frames. Of course, in fiction, "textual polish" doesn't lie only in omitting superfluities; it's also a matter of coming up with words and phrases that cut through the reader's complacency. Words are spooky objects. Nobody really knows how they work. As Walker Percy once observed, why in the world should "flesh is grass" be a truer and more effective observation than "flesh is mortal"? It helps that I'm a slow reader. I think maybe I have a mild form of dyslexia. Because I have to negotiate every paragraph word by word, I tend to notice the particular ways that a master stylist -- John Updike, say, or Vladimir Nabokov -- uses rhythm, diction, and syntax to make the magic happen. Whatever one may think of The New Yorker type of story, it certainly scans, which is more than I can say for most genre fiction. A very consistent feature of your writing seems to be your concern with the responsibilities of parenthood -- indeed, transcending that, the absolute love of parents for their children. How personal -- how autobiographical -- is this thematic thread in your novels? I'm glad you noticed the responsibility theme. If there's a central idea that ties all my work together, it's the issue of "what we owe children." To fulfill your responsibility to a child, you first have to become an adult. You gotta grow up. As I write these words, George W. Bush is on the point of claiming the dubious election of '00. I don't dislike Bush just because he can't think clearly. I dislike him because he's not a grown-up. Neither is his father, so what do you expect? I have a 22-year-old daughter and a 12-year-old son, and I'm happy to report that they've never faced the particular horrors that menace the children in The Continent of Lies, This Is The Way The World Ends, City of Truth, and The Eternal Footman. God knows, Kathy and Christopher have had their setbacks, but what you're encountering in my fiction is not any actual disaster in my children's lives but my bedrock fear of losing them -- the same primal parental nightmare that runs through John Irving's The World According to Garp. I think this sort of salutary terror is what makes the world go round. There comes a point in the parenthood experience when you realize you would gladly give up your own life if that meant saving the child's. This is not a particularly noble or selfless impulse, I feel, because you don't seem to have much choice about it. I think it's wired into the universe. But it's there, it's palpable, and it's why I'm not a nihilist like Vonnegut. Of course, there's certainly lots of low-level autobiography happening in my fiction. I'm constantly looting my children's lives for material. Some of the lines said by the fictional Holly in This Is The Way The World Ends were said by Kathy when she was three. And like Kevin Burkhart in The Eternal Footman, Christopher does magic tricks. Looking back at the cultural criticism contained in The Continent of Lies, and at the anti-nuclear stance of This Is The Way The World Ends: do you still feel as passionately about those issues as you did then? Do you think such topical satire is blunted by the passage of time? What makes a novel valuable, I feel, is not its immediate subject but its themes. In conventional literary fiction, at least, the way to the universal is always through the particular. When a reader today picks up a Jane Austen novel, a Shakespeare play, or The Divine Comedy, he automatically performs a weird mental operation that redeems the text of all temporal parochialism. The fact that Austen, Shakespeare, and Dante are not contemporary is not just irrelevant, it's less than irrelevant. I don't understand this operation -- it's actually rather mysterious -- but every author is grateful for it, especially the dead ones. "Topicality" becomes a problem only when there's nothing else going on in a book. This Is The Way The World Ends is manifestly about the East-West nuclear standoff that obtained during the Reagan eighties, and as such it's a rather passé fulmination. Indeed, if I had it to do over again, I wouldn't have used so many specific dates in that book. World Ends explicitly asserts that humankind will extinguish itself in 1995, and the contemporary reader may become distracted by his recollection that this catastrophe did not occur. But I like to think that at the thematic level, the level of universals, World Ends is still a pertinent story. The overarching ideas -- the primacy of parental love, the Devil's bargain that humans have struck with their own ingenuity -- still have currency. I have no objectivity here, of course, but I do know that many people enjoy Dr. Strangelove as much now as when it first came out, even though the doctrines it attacks became obsolete decades ago. As for The Continent of Lies, it's actually acquired a strange sort of relevance of late, because now the reader can see it as a prediction of Virtual Reality -- though that was the last thing on my mind. I should mention in passing that some critics took Continent to be a qualified defense of censorship, which was also the last thing on my mind. Your Nebula Award-winning novella City of Truth has a universal theme, relating to the simultaneous desirability and cloying excessiveness of pure veracity. There's a balance to your polemical technique here that, for me at least, marked your full maturation as a satirist. Is such an awareness of both sides to an argument --illustrated most directly by the debating format of Blameless in Abaddon -- indeed a prerequisite for truly successful satire? You've hit on the right word -- awareness. I think that the worthiest stories and novels are informed by a generosity of spirit. This doesn't mean that the author avoids taking a stand; it's pretty clear that, in the long run, James Morrow has no use for the Cold War apologetics dramatized in This Is The Way The World Ends or the various theodicies presented in Blameless in Abaddon. But it's important not to demonize the enemy. The think-tank boys who framed so-called "nuclear strategic doctrine," as well as those Christian theologians who wrestled with the problem of evil for so many centuries, were not knaves or idiots. I think they were wrong, but if I deny their basic humanity, I have no right to make a case against them. I often say that the measure of fiction is not its heroes but its villains. Manicheanism, I feel, is perhaps the single worst idea our species ever invented. The human race does not divide neatly into the Forces of Light and the Forces of Darkness, and endless misery has accrued to the supposition that it does. Aside from Frank Herbert's stylistic limitations, the thing that makes Dune a second-rate piece of literature is its unconsidered endorsement of the Manichean ethos. In The Art of Fiction, John Gardner uses a similar anti-Manichean argument to criticize mainstream novels like The Grapes of Wrath. I'll always be prepared to applaud curmudgeonly satire of the sort we associate with Jonathan Swift, Kurt Vonnegut, Walker Percy, and Evelyn Waugh. But with satirists like Mark Twain, Joseph Heller, and even Voltaire, you find a genuine curiosity about the fools who wreak so much havoc on the world. The presentation of the evangelical in Only Begotten Daughter, the depiction of C.S. Lewis in Blameless in Abaddon, and the implied portrait of the off-stage functionaries in City of Truth were as sympathetic as I could make them without sacrificing my satiric edge. An appealing feature of City of Truth, and of the short fictions gathered in Bible Stories For Adults, is their remarkable compact lucidity. And you continue to produce short stories of note. Are you contemplating another collection in the near future? In recent months, after an absence of about six years, I've begun returning to the medium of short fiction. By 2002, I'll probably have enough stuff for a second major collection. But I'll be honest: my heart is in the novel form, not the short-story form. Most of my short pieces get written when an editor invites me into an anthology. When I'm finished, I'm usually glad I wrote the story in question, but it probably wouldn't have happened without an editor's prodding.